This week for Tuesdays with Dorie our Hostess, Kelly of Baking with the Boys, picked Fresh Mango Bread. Although I am not a fan of mango, my husband loves them! So I was happy to make the Fresh Mango Bread. The recipe called for 1 mango and to add an extra level of flavor to the bread I sliced up the mango and sauteed it in butter just until it turned a golden brown. The mango should have yielded 2 cups after dicing. But even though I bought a good sized mango after dicing I barely had a cup of fruit. Unfortunately, this week is not a big fruit week at my house and all I had in stock were 3 purple plums. So I diced up the fresh plums as a substitute for the missing 1 cup of mango. In place of the raisins I used diced prunes. At about 3 pm the temperature started dropping but it was the same time I popped the Mango Bread in the oven so the cold front was perfect timing. The bread smelled wonderful while baking. But after tasting I do wish I had added a bit more cinnamon and little less ginger. 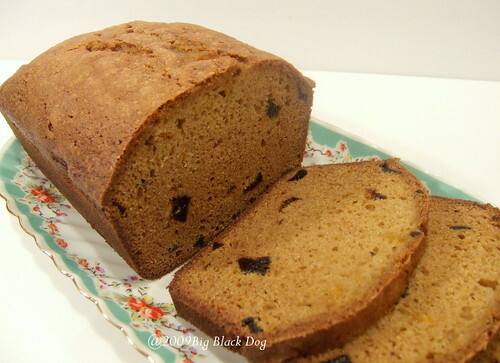 If you'd like the recipe for Dorie's Fresh Mango Bread you can either buy, "Baking from my Home to Yours" by Dorie Greenspan or visit our hostess Kelly of Baking with the Boys and she will have the recipe posted on her site. I'm starting a new feature on my blog, Gadgets that Work. We've all bought nifty gadgets only to find out that they really did not perform as expected. So I thought I would start highlighting some of my wonderful Gadgets that Work! My husband does not buy me many things for my kitchen, but he does buy me knives and I love it! I never really think about knives and just muddle through with what I have. Last Christmas he bought me a Pink 5 1/2" Kyocera Ceramic Santoku Knife. It is the most fabulous knife I have ever used. Usually I just use my Ceramic Knife for vegetables but today I cut the Mango Bread with it and LOOK at how perfect those slices are! Even though the bread was freshly baked, the Kyocera Ceramic Knife did not even damage the crust. I was amazed! If you're considering a new knife, this is one knife that I highly recommend. It is definitely worth saving your pennies for! The above video is short and sweet but with some good information on the Ceramic Knife. If you have a minute it is worth the view. Is the ceramic knife good for meats as well? Is it brittle so that it breaks if dropped or nicked if thrown in with other steel knives? I use serrated knives for meat so have not tried my ceramic knife on meat yet. There is a serrated ceramic knife and I hoping it will be my Christmas Present this year. I keep all my larger knives in sheaths for storing. I don't like the idea of large, sharp objects being stored without some protection. I value my fingers! Large knife sheaths are inexpensive, abt $2-3. I've had a ceramic pizza cutter for several years and have not chipped it yet and I keep it loose in my utensil drawer. The ceramic pizza cutter will be highlighted some day on my "Gadgets that Work". I love it! I know people say that ceramic utensils chip fortunately I've not had that problem yet. But I think anything that is abused will not last long. I love the sound of mango bread. You are very lucky to have a man that buys you cool kitchen stuff.It may be a rare occurance ,but its great! The bread looks delicious! I like the substitutions you made, even if they were out of necessity. Also, nice knife--and very nice husband! 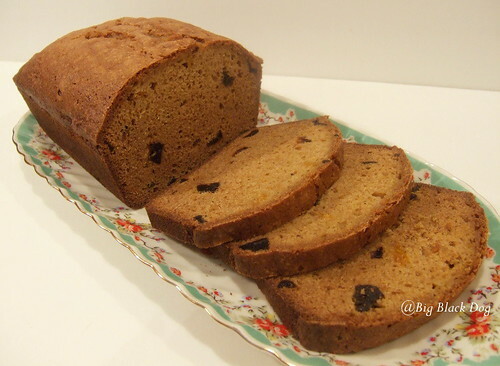 Next time I see mangoes on sale I am DEFINITELY making this bread! Thanks for the tip. I only found out about TWD from your blog - I spent sooooo much time yesterday bouncing around everyone else's blog over there, looking at all the goodies that were made and also the little variation's that people were coming up with. I will probably even get Dorie's cookbook now as a direct result, you all made it look so wonderful! Ooooh plums and prunes! What interesting additions! I LOVED this bread! Yours looks great! A ceramic knife - very interesting! Never heard of it before, but definitely worth looking into! I am a wellness coach and with these recipes , well .....I can taste it !! For the knife part ,ceramic is also a first for me. I bet that bread is something else warm from the oven with some butter. And maybe a cup of coffee. I didn't add as much ginger, and I thought it was perfect. I have often wondered if those ceramic knives were worth it and how you sharpened them. Does it stay sharp? Is it easily broken? Can you stick it in the dishwasher? Wow, your bread looks soo nice! I like the height in it. And I want a ceramic knife now - those slices are really clean! The ceramic knife is fine in the DW. Although I rarely ever put any of my knifes in the DW except steak knives. For storange I keep sheaths on all my larger knifes just for protection. A large sheath is very inexpensive maybe $2-3 at most. I bought my knife sheaths at Sur La Table. The Ceramic Knife advertises with daily use it should stay sharp for at least 10 yrs. However the ceramic knife is not for cutting through bone as it will chip. I don't use my knives to cut through bone any how I use my kitchen shears or have the butcher do it. For vegetables, fruit or bread you can't get much better then the Ceramic Knife. I also have a ceramic pizza cutter and I just love it. I store it loose in my utensil drawer and so far no chips at all. It cuts effortlessly! It will be included at some point in my Gadgets that Work. maybe i'm just REALLY HUNGRY, but i swear my mouth started watering just reading the words 'mango' and 'bread'. keep up the good work. The bread looks great, and love the pink knife! Michelle, this bread looks fabulous! I love that you sauteed your mango before throwing it into the batter. How genius! And I bet the plums were a welcome addition. You have me lusting after a kyocera knife to boot!! YOur bread looks great. I think prunes would go well with it too! My family loved it and I want to add cinnamon chips the next time I make it! I just bought a Kyocera ceramic paring knife the other day. Love it. It goes through tomatoes like butter! This bread looks great. I have a ton of mangoes, and am going out tonight looking for more. They fall on the ground around here. Sautéing the mango first sounds very intriguing. I bet that made your bread extra tasty! Sounds like some great variations. Looks delicious. I love mangos and I'm so glad to find a new way to prepare them. Sometimes you get a rather hard, underripe mango, but the sauteeing really softens it up and brings out the flavor! Oh, the bread looks really beautiful...and the plate is gorgeous, too, especially with the bread on it! I have always wondered about those ceramic knives...they look so interesting and pretty...I think I need to try one out, don't you? Plums sound like a good addition. And oddly enough, prunes are quite popular with my kiddos, so I usually have some around. I'll have to keep them in mind if I make this one again. I've made Mango bread before and it didn't look at all like yours. It was very moist and is the favorite at a local resturant. I'm longing for that mango bread again! Yum. Love your gadget focus. Thrifty Thursday and my First Treat!! !